Folders from versions past may be full of gigabytes of duplicates or unwanted files. I noticed in the Movies folder that there are all these iMovie folders and then the iMovie Library which contains most of the data. I am going to guess that I am looking at the old and new way Apple used to store iMovie files. What can I get rid of? Some iMovie folders may be full of duplicates or unwanted files. 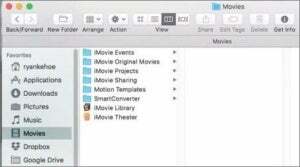 iMovie Events, iMovie Projects, and iMovie Sharing were used by older versions of iMovie for storing clips, projects, and exported (shared) files. If you’ve updated to iMovie 10 and you no longer want to use a previous version, you can delete iMovie Projects and iMovie Events. Check iMovie Sharing to make sure there’s nothing you exported there that you want to keep. iMovie Library. Starting in version 10, iMovie puts everything inside a monolithic library file that’s in package format. You use iMovie to navigate what’s in it and delete clips or projects. You can also right-click the file and choose View Package Contents to see what’s inside, but I wouldn’t mess with it that way. This monolithic file can be moved among disk drives if you want to store it somewhere other than your boot volume. Ryan also has a folder labeled iMovie Original Movies. This folder contains the full-resolution versions of older versions of iMovie projects, rather than a lower-resolution exported one. It may contain movies that you have no other copies of, so be careful about deleting its contents, too. By looking carefully at what’s duplicated and no longer needed, you could recover from hundreds of megabytes to gigabytes if you’re even a casual user like me. Video adds up.